Minister of Tourism Melanie Joly looks on as Prime Minister Justin Trudeau answers questions from the media during a question period at the Vancouver Island Conference Centre during the final day of meetings at the Liberal cabinet retreat in Nanaimo, B.C., on Aug. 23, 2018. For two days in July, Mélanie Joly acted like a normal minister of Canadian heritage, attending events in the Gaspésie such as the unveiling of a mural and visiting cultural institutions. Unbeknownst to almost everyone, Prime Minister Justin Trudeau told her before the start of the visit that she was about to lose her job. Instead of running her high-profile department, she would be put in charge of a jumbled, lower-tier portfolio made up of Tourism, Official Languages and the Francophonie. Announced on July 18, the demotion stung. A 39-year-old lawyer, Ms. Joly is an ambitious politician who tried to revolutionize Canada’s cultural policy. She ended up overpromising and underdelivering, hamstrung by a controversy in Quebec over the Liberal government’s refusal to impose sales taxes on the Netflix video-streaming service. The Prime Minister and his top advisers felt the shuffle offered Ms. Joly the best chance at a political redemption, said senior officials, who discussed the Prime Minister’s thinking on the condition of anonymity. She still benefits from a high public recognition rate in Quebec, and the Liberals are hoping that she will re-emerge as a draw in next year’s federal election campaign. Sitting down for an interview in Montreal’s fashion district, in the heart of her riding, Ms. Joly continues to project the confidence that characterized her stint at Heritage, but also a newfound humility. She boasts about her accomplishments at Heritage, but also admits to “rookie mistakes” that marked her tenure. 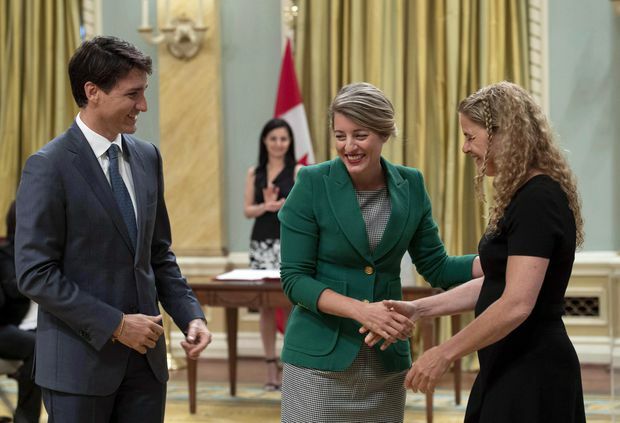 Ms. Joly (centre) shakes hands with Governor General Julie Payette after being sworn in as Minister of Tourism, Official Languages and La Francophonie, as Prime Minister Justin Trudeau looks on at Rideau Hall in Ottawa on July 18, 2018. Involved in politics since college and law school, Ms. Joly was a star candidate when she announced she was running for the Liberal nomination in the riding of Ahuntsic-Cartierville in 2015. She won the seat with a majority of more than 9,000 votes, and seemed like a perfect fit at Heritage when Mr. Trudeau unveiled his first cabinet. The early goings were rewarding, as she injected billions in new funding at cultural agencies such as the CBC and the Canada Council for the Arts. Showcasing a desire to leave a mark at Heritage, Ms. Joly then decided to modernize Canada’s cultural policies to give Ottawa a form of leverage over the likes of internet giants Google, Facebook, Netflix and YouTube. 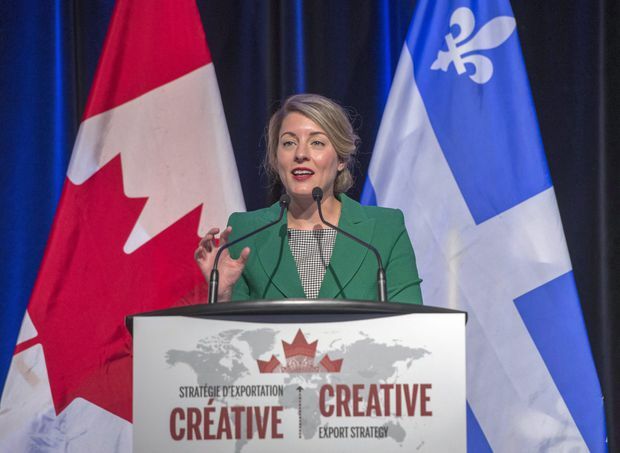 She launched a review of Canada’s cultural policy in the spring of 2016, stating at the time that “everything is on the table.” On Sept. 28 of last year, Ms. Joly unveiled a new policy that she called “Creative Canada” at a lunch-time speech at the Château Laurier in Ottawa. The biggest surprise that day was a deal that capped off weeks of secret talks between the federal government and Netflix. Under a confidential agreement, the company committed to spend $500-million over five years producing Canadian content in this country, in addition to $25-million to develop production capabilities in the French-language market. Ms. Joly pitched the deal as evidence that her strategy was working. "We went and got the biggest investment in the last 30 years in Canadian content from a foreign company," she told reporters. But the announcement did little to assuage the concerns in Canada’s cultural community. For starters, Netflix made it clear that day that it wasn’t ready to provide any further details of its intentions in Canada, with no one from the company in attendance at the speech. Ms. Joly unveils Canada's first Creative Export Strategy at a news conference June 26, 2018 in Montreal. “We thought that as part of a Canadian policy to develop culture, signing a deal with an American giant, and relying on that American giant to save Canadian culture, that wasn’t the right time nor the right moment,” said Hélène Messier, president of Quebec’s association of movie and television producers, in a recent interview. Ms. Joly and her staff failed to anticipate another backlash, this one over the issue of sales taxes. Right after the speech, she travelled to Montreal to tape an appearance on a highly rated Quebec talk show called Tout le monde en parle. Other guests on the show, including economic journalist Gérald Fillion, took her to task for failing to force Netflix to collect sales taxes on its subscription services, unlike domestic rivals. Seemingly unprepared, Ms. Joly was stuck defending the Liberal Party’s 2015 commitment not to tax Netflix with worn-out media lines. By the time the show was broadcast four days later, on the following Sunday night, Ms. Joly had entered the political equivalent of a death spiral. In ensuing months, Ms. Joly could hardly do or say anything without facing questions on the lack of a tax on Netflix. Columnists and editorial cartoonists piled on, and she was a punch line in the year-end comedy shows that are unique to Quebec’s political culture. One of her legacy pieces will be a review of the Broadcasting Act and the Telecommunications Act, which she launched in June. However, the results are only due in 2020, after the next election. In her new portfolio, she has kept responsibility over Official Languages and taken on the Francophonie, a group of states that she will lobby as part of Canada’s efforts to win a seat on the UN Security Council in 2020. But tourism is the biggest component of the portfolio, given it’s an economic issue that could drive future growth across the country, with 1.8 million jobs in Canada that depend on the industry. As part of her mandate letter, Ms. Joly has to build a new tourism strategy before the next election. In the interview, she said that on the day she learned about her impending shuffle, she decided to see it as a positive shift in her career. As part of her new job, Ms. Joly wants to make her politics about the workers she represents, whether they are hotel employees in Vancouver or restaurant staff in the Gaspésie. “I am not defending public policies, I am defending people,” she said. 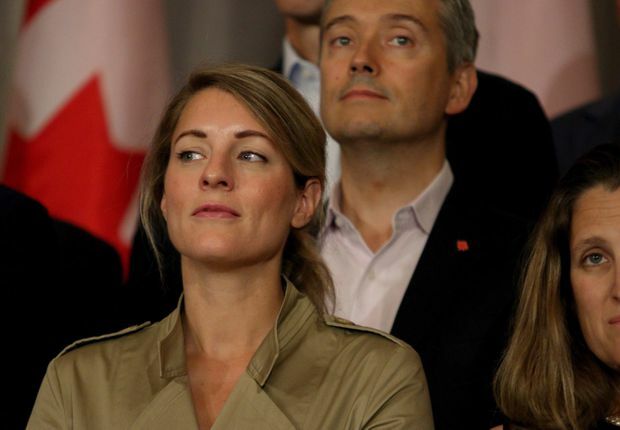 Ms. Joly credits a form of “resilience” for her ability to withstand the political attacks at Heritage, and her belief that she is now ready to mount a political comeback.